Information Technologies & International Development journal has just published its Vol 8, Issue 4 Winter 2012, a special bilingual issue featuring research on ICT4D from Latin America. This issue features a piece written by me, the book review of ComunicaciÃ³n mÃ³vil y desarrollo econÃ³mico y social en AmÃ©rica Latina [Mobile communication and economic and social development in Latin America], by Mireia FernÃ¡ndez-ArdÃ¨vol, HernÃ¡n Galperin and Manuel Castells. As a bilingual issue, my book review has both been published in English and Spanish: please follow the links below to download the reviews. It is worth reminding that, back in September 2011, Manuel Castells offered a presentation of the book which I attended. 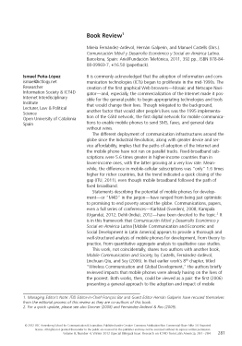 My notes can be read at Mobile communication and economic and social development in Latin America . “Book review: ComunicaciÃ³n MÃ³vil y Desarrollo EconÃ³mico y Social en AmÃ©rica Latina“. In Information Technologies & International Development, 8(4), 281-284. Cambridge: MIT Press. “ReseÃ±a de Libro: ComunicaciÃ³n MÃ³vil y Desarrollo EconÃ³mico y Social en AmÃ©rica Latina“. En Information Technologies & International Development, 8(4), 285-289. Cambridge: MIT Press. Peña-López, I. (2012) “Book Review: ComunicaciÃ³n MÃ³vil y Desarrollo EconÃ³mico y Social en AmÃ©rica Latina” In ICTlogy, #111, December 2012. Barcelona: ICTlogy.